In some ways these studies can be thought of as the older, wiser brethren of those in the Acme Volume Profile Pack. They are called time-price-opportunity (TPO) studies, which was a concept invented and popularized by J. Peter Steidlmayer. Though these studies are keeping with tradition, we think you’ll find that they have some interesting twists, Acme style, that are anything but traditional. TPO studies really are a must-have for any trader trying to get a handle on a market’s bigger picture, from the auction theory perspective. Classic to the core but with a super-clean and modern design, this is the latest addition to the Acme TPO lineup. 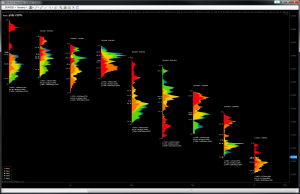 Designed specifically for intraday use in traditional TPO analysis. Available in the Pro Edition only. Displays TPOs of virtually any duration, starting from as short as 1 minute, and features a configurable initial balance (IB) duration as well as independently-configurable value area widths for the TPO and volume profiles. 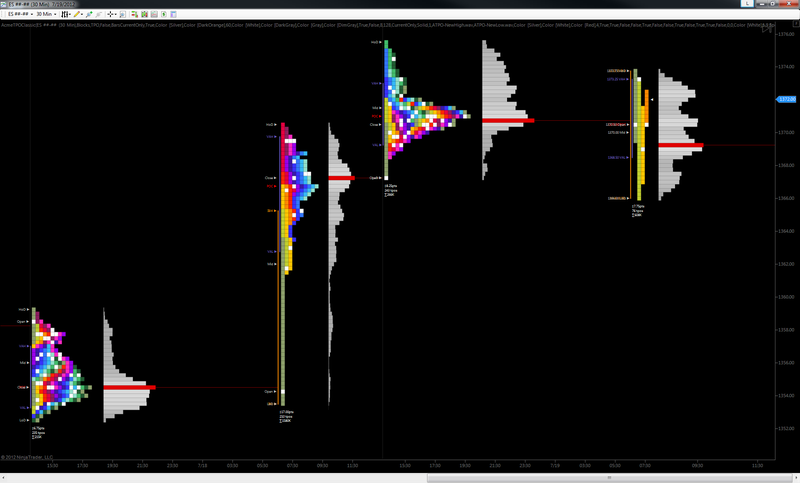 The number of prices (ticks) per profile level are configurable. 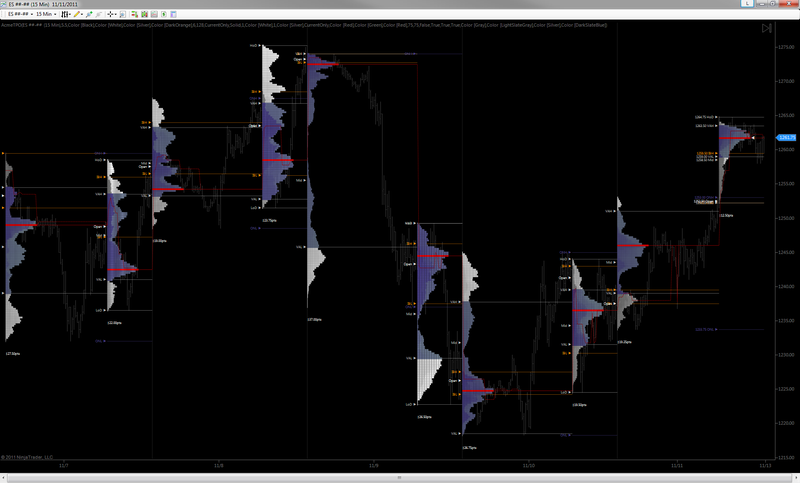 A setting of 1 (the default) results in the most detailed profiles. 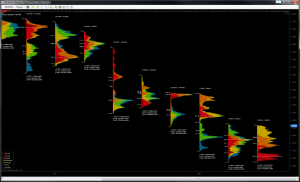 Higher numbers reduce profile resolution but make letter-based displays easier to read, particularly on instruments with small tick sizes such as CL, GC, TF, NQ, stocks/equities and others. Displays TPOs in any of 4 styles: profiles with color blocks; profiles with letters; bars with color blocks; and bars with letters (see below). 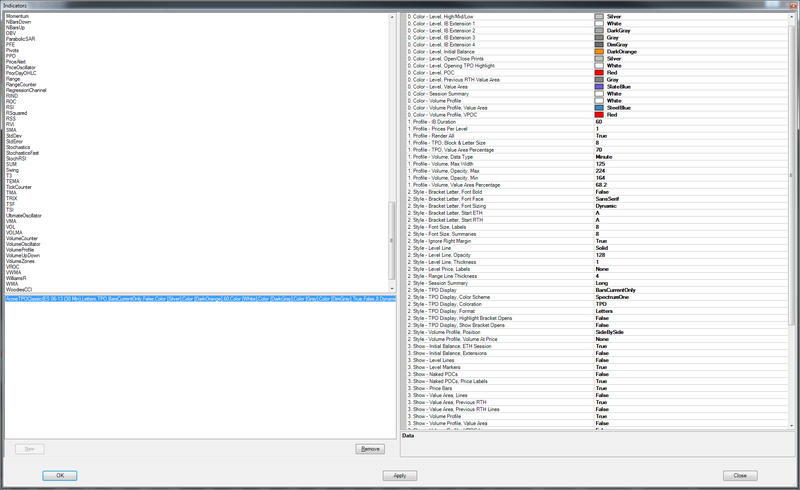 Many profiles can be merged into a single profile and “un-merged” back to discrete profiles using the chart right-click menu (see below). 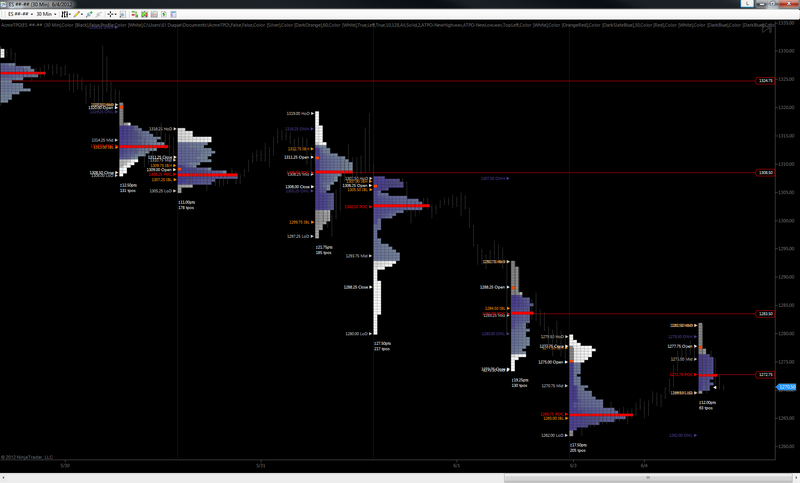 This can be extremely useful when the market is balancing across multiple sessions or is breaking out of balance to see new value higher or lower. Displays either side-by-side or stacked volume profile using either minute for maximum speed or tick data for maximum precision, as with the other Acme Volume Profile studies. 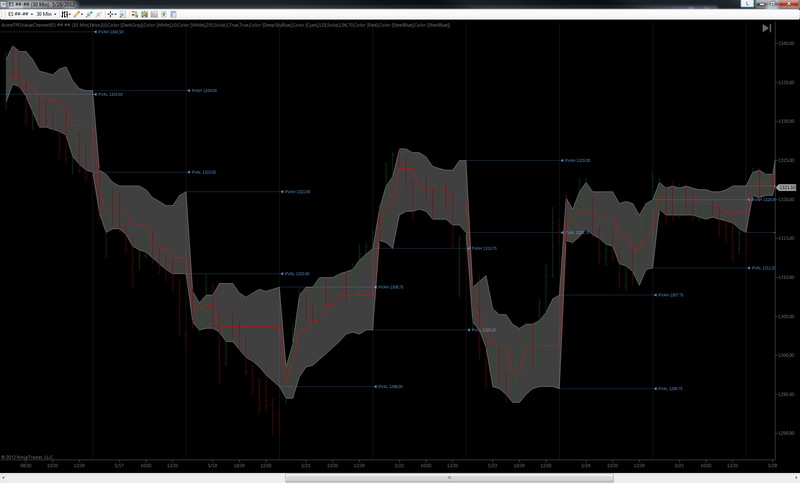 The stacked style can help maximize information density on your charts. See below. 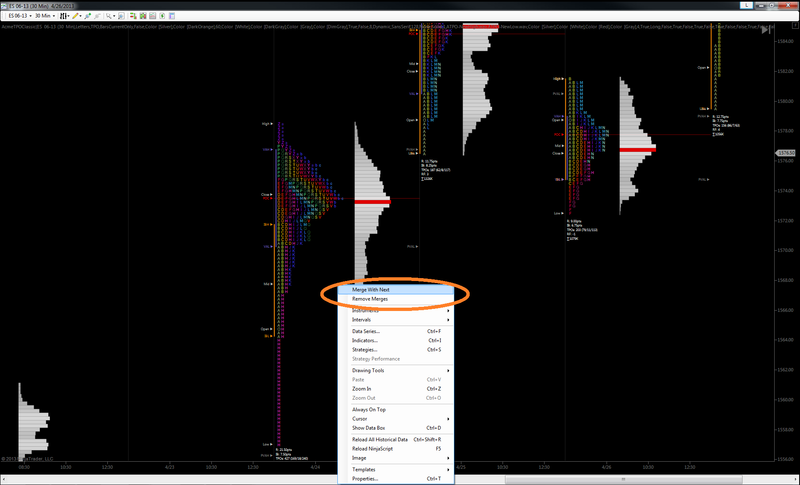 The previous value area can now be displayed on the current profile, similar to the Acme Volume Profile. When bracket letters are displayed, they can be in sans serif (modern, screen-friendly) or serif (traditional) type. 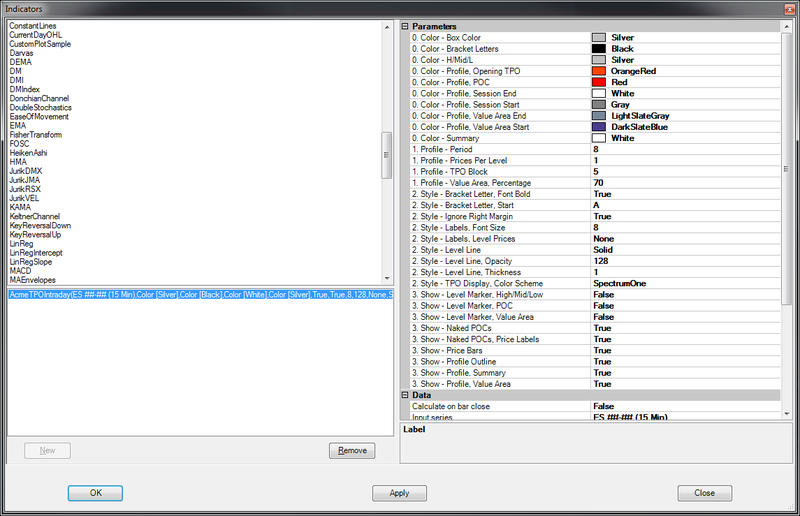 TPO blocks and brackets can now be dynamically sized or displayed in a fixed, configurable size. Optionally displays volume-at-price, if the volume profile is displayed. 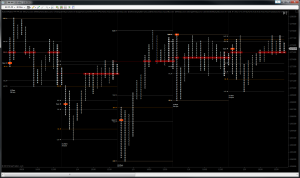 Optionally displays TPO counts above/at/below the POC in the profile summary. 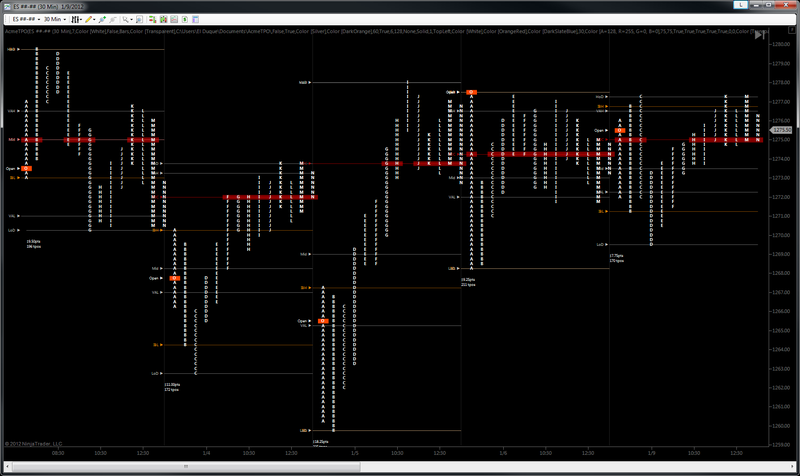 Optionally displays the session rotation factor in the profile summary. Profile summaries have both long (detailed) and short styles. See below for additional detail on the Long summary style. Optionally displays “naked” RTH POCs until they are touched in a subsequent RTH session. Optional audio alerts for new session highs and lows with specialized alerts in the audio pack for the ES, NQ, YM, TF, CL, 6E and the bonds. Separately configurable starting bracket letter for ETH and RTH sessions. 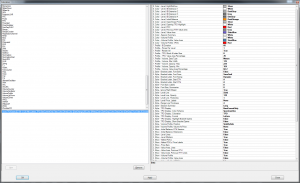 Value area widths are configurable, and the TPO and volume value areas can be independently set. Configurable opening TPO color for the RTH session. The open price for each period can be highlighted with a reserved letter, a special color or both. 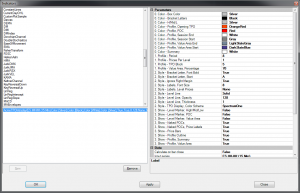 Supports split RTH and ETH profiles for most instruments. Automatically calculates the initial balance (IB) range for both ETH and RTH sessions. 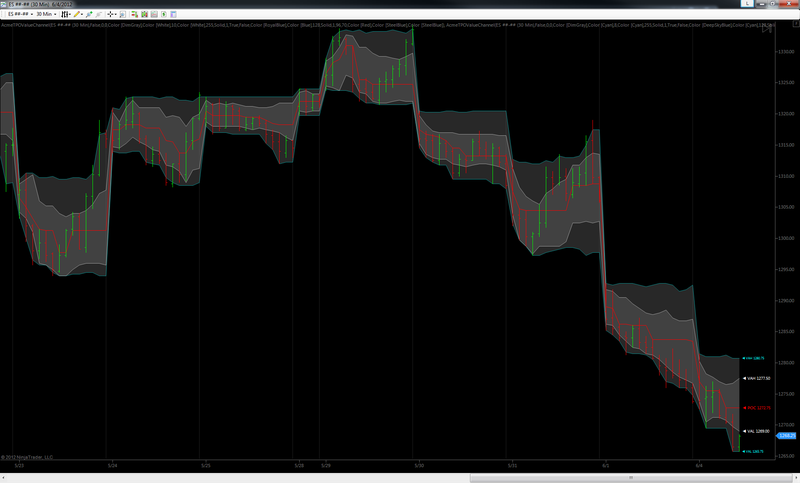 Automatically plots the session open price, midpoint, high of day and low of day with optional price labels. 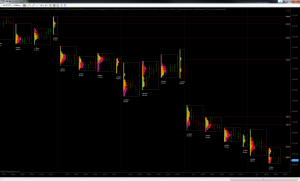 Volume profile can be turned on or off, volume profile value area can be turned on or off. Session levels lines can be turned on or off. Session level markers can be turned on or off. 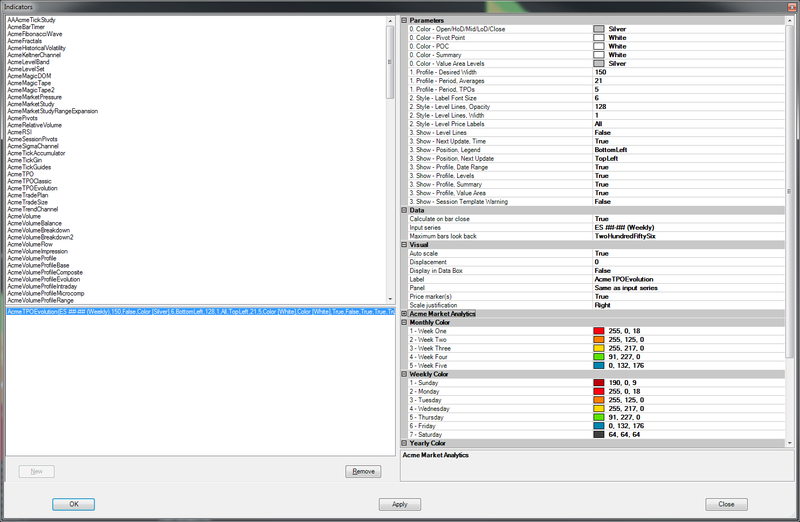 Key session level lines can be configured to your desired color, width, style and opacity. 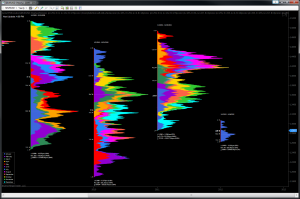 All colors can be finely tuned for virtually any chart color scheme you can dream up. 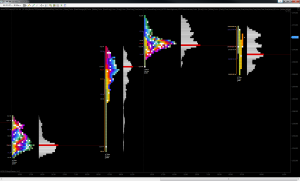 Flexible, fresh and feature-packed while still remaining in touch with it’s traditional roots, the Acme TPO can be used on ultra-short time frames or to analyze years’ worth of price action. Available in the Deluxe and Pro Editions. 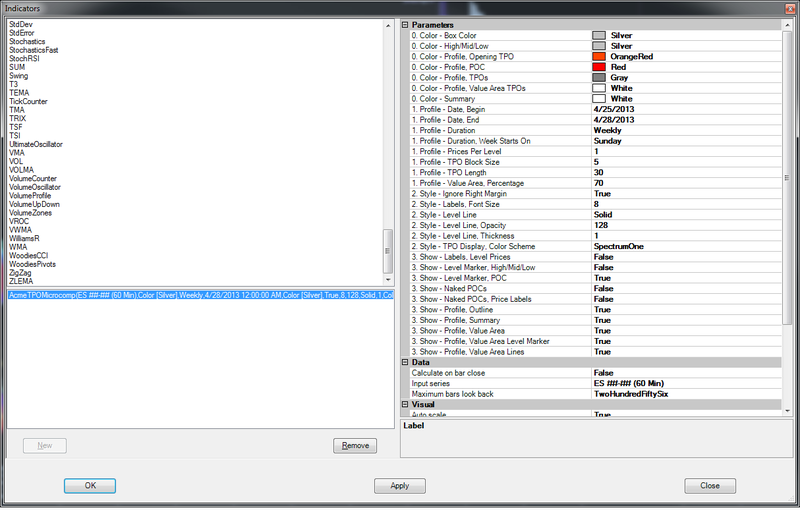 While the default setting TPO period is the traditional 30 minutes, you can select any value you like from 1 minute up. At the lowest end, the 1-minute period setting effectively makes this a minimalists volume profie and the TPOs are very fine-grained. The larger the time period, the coarser the TPO blocks. Adds the traditional ABCDEFG time bracket labels on the TPO blocks – though only when using the traditional 30 minute period. 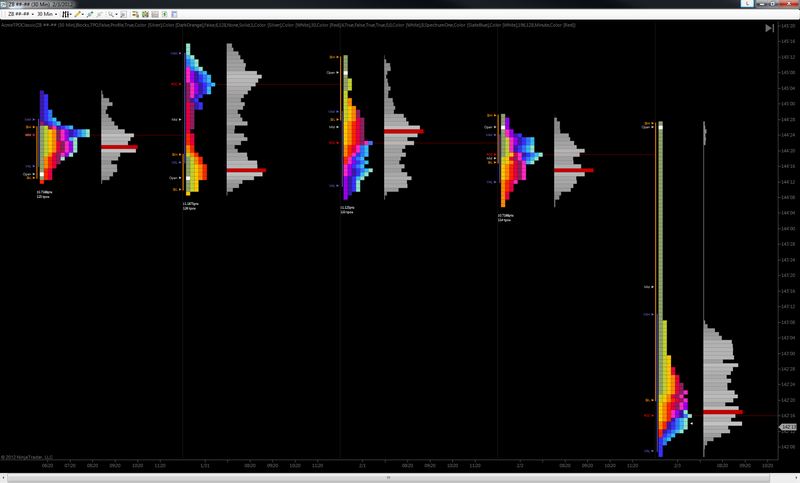 Initial Balance duration can be set to values other than the traditional 60 minutes. Value Area percentage is configurable from 1 to 99% of TPOs, with the default set at the traditional 70% (1 sigma). 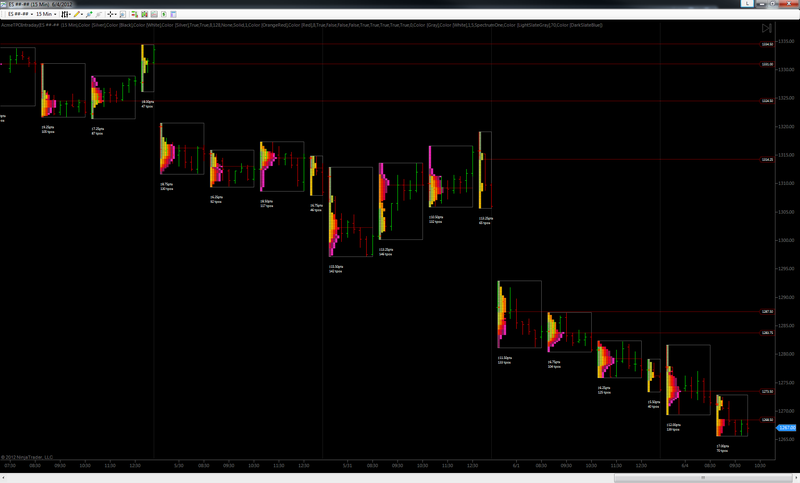 Optionally displays up to 4 levels of 50% initial balance extensions. 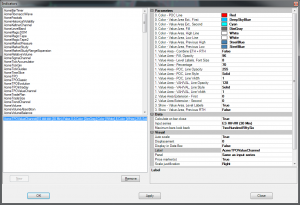 Has 2 display styles – the familiar Profile display style as well as the Bars display. 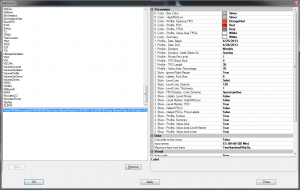 TPO profile statistics can be exported as a .csv file for analysis in external applications such as Microsoft Excel or Google Spreadsheets (Pro Edition only). See images below and watch the screencast! 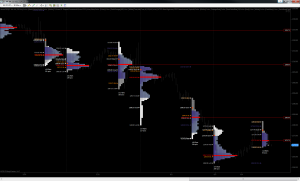 Includes optional value area high and low session level lines, and shows the previous RTH value area high and low prices on the the next RTH session. Configurable starting bracket letter for both ETH and RTH sessions. Configurable opening TPO color for the RTH session. Split RTH and ETH profiles can be combined on an ETH chart with an indicator parameter. Optionally plots RTH session pivots when on an RTH chart or ETH chart using split ETH/RTH profiles. No need for a separate pivots indicator any longer! 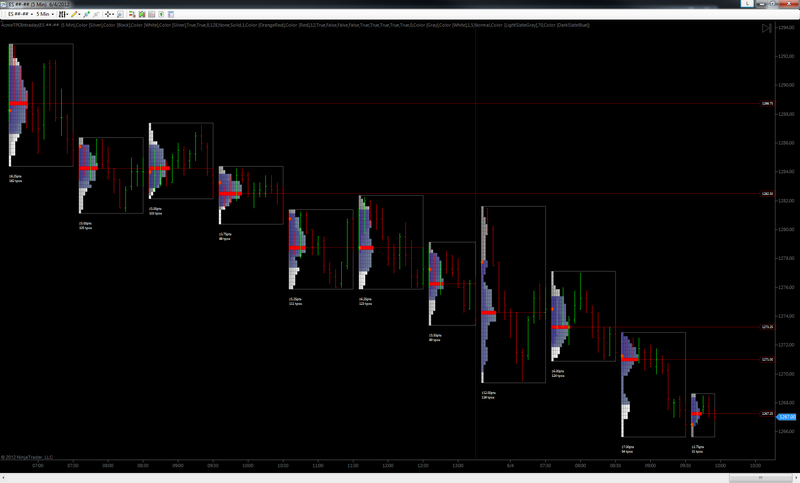 Supports long-term profiles on weekly, monthly and yearly bars. See below for more detail. Automatically calculates the Initial Balance (IB) range for both ETH and RTH sessions, and the IB duration is configurable. Automatically plots the ETH session high and low on the next RTH session if the chart is using the NinjaTrader ETH session template. Automatically labels the current session range below the profile. Automatically plots the session open price, midpoint, high of day, low of day and close with optional price labels. Session levels can be turned on or off, according to your preferences and time frame. 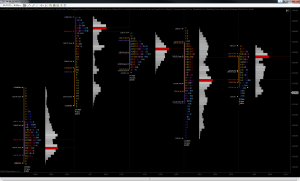 For instruments with an RTH and an ETH session, each day can be split into multiple profiles and merged back together. 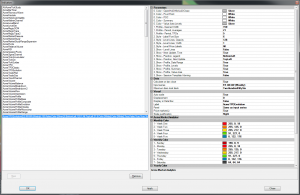 Key session level lines can be configured to your desired color, width, style and opacity. Session level markers can be attached to the left or right of the session, independent of the profile. 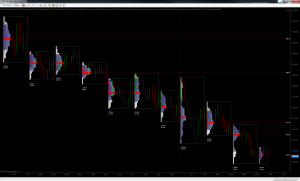 Can be used on any built-in NinjaTrader chart type regardless of the TPO period selected. All colors and color intensities (opacity) can be finely tuned for virtually any chart color scheme you can dream up, and supports 2 pre-defined, high-contrast spectrum as well. 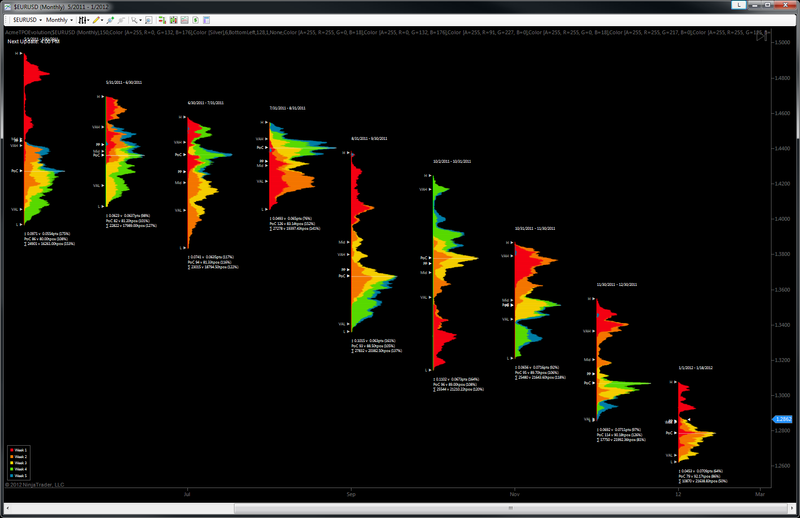 While it’s true that other TPO studies in this pack focus on profiling days, weeks and even years’ worth of time, the intraday study is specially designed for much smaller time frames. You can now profile individual bars or blocks of time. If you are a short-term trader or scalper considering TPOs, this study is for you. 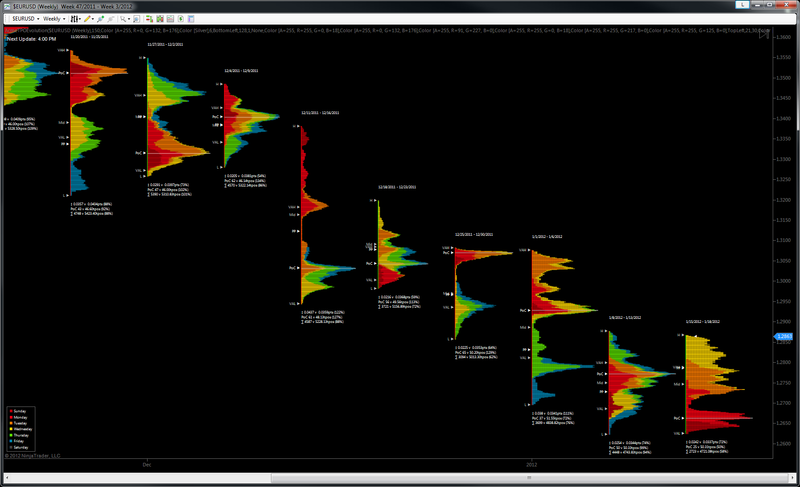 Have a look and consider how it might add some new depth to your trading strategy. Available in the Pro Edition only. 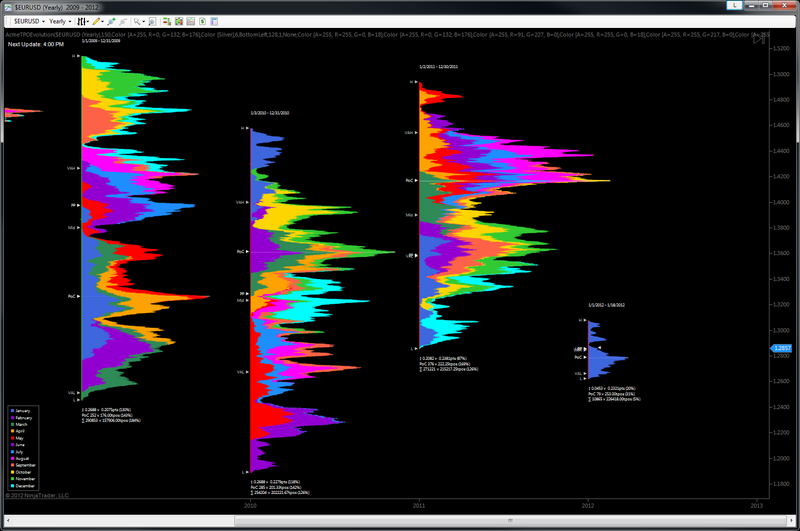 As with the other profile studies, this study can be used on bars with any minute periodicity. 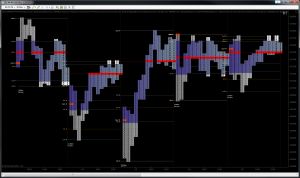 Profiles can optionally display the traditional 1-sigma value area, and value area widths are configurable. 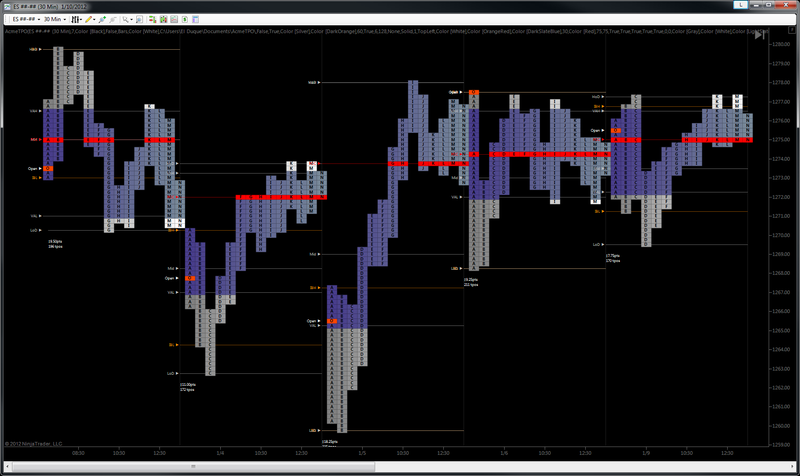 Extends naked POCs over subsequent bars or blocks until that price is tagged in a later profile and naked POCs can have optional price labels next to the chart price scale. Periodicity of the profiles are flexible, so virtually any combination of TPO length and profile length is possible. 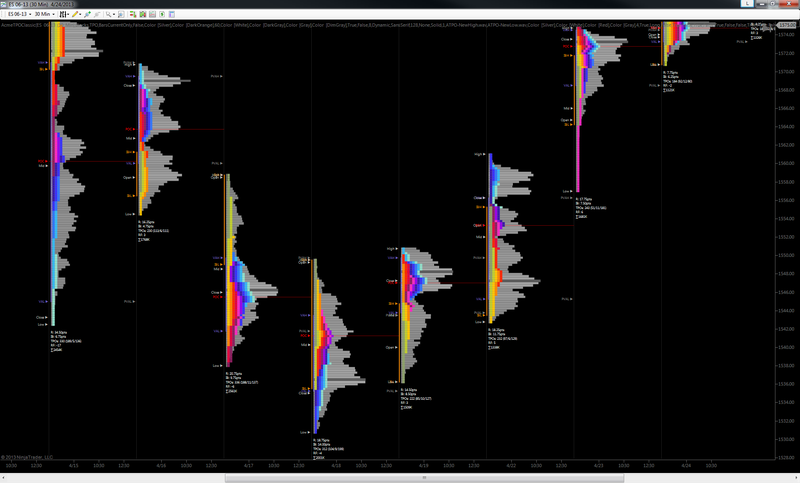 Shows an optional TPO count and range summary below each profile. As with the other studies, all colors and widths can be finely tuned to integrate into your existing charting scheme and supports 2 pre-defined, high-contrast spectrum as well. 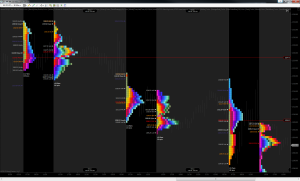 If you’re a TPO trader or trade a mean-reverting instrument, this may be one study you won’t want to find yourself without. 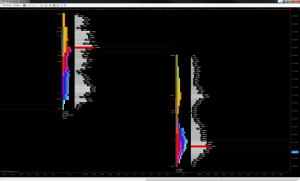 Like the Acme Volume Value Channel study, this tracks just the session value area and nothing but the value area as it develops in real time. And it contains a number of interesting and innovative features. Available in the Pro Edition only. 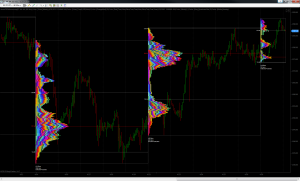 Value areas can be generated with any minute periodicity. 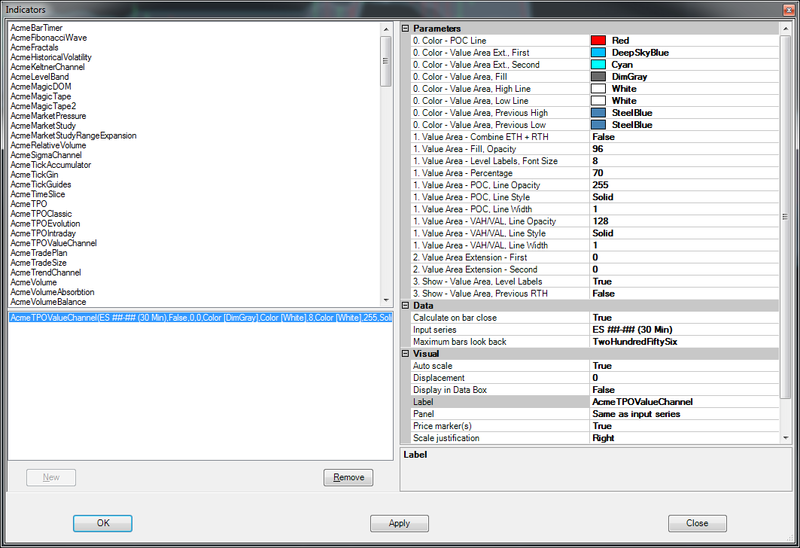 Value area width is configurable. The default setting is the traditional 1-sigma range (70%), but value area channels from 1-99% can be displayed. Multiple value channels, each with a different width, can be layered on a chart to further enhance a value-based trading strategy. 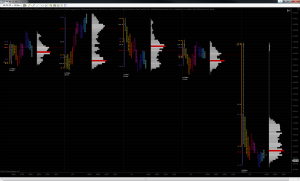 The previous RTH session’s value area can be optionally projected onto the next RTH session. 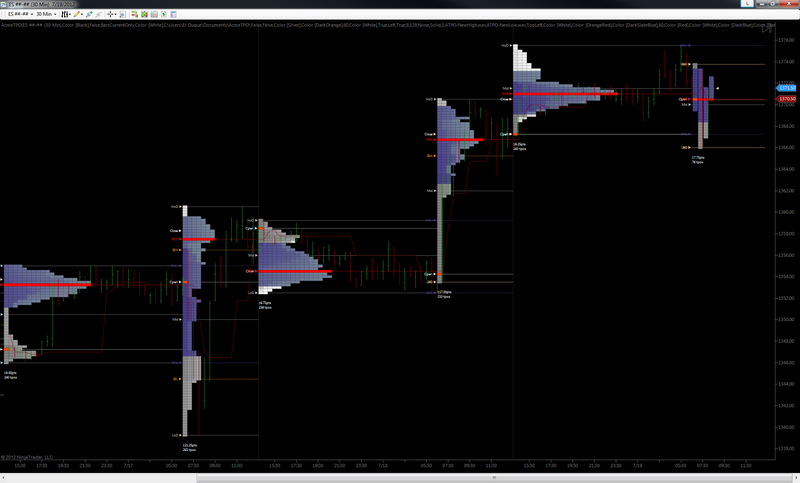 Up to 2 extension levels can be specified to assist in gauging how far price has moved away from value at a glance. As with the other studies in this pack, all colors and widths can be finely tuned to integrate into your charting scheme. The companion to the micro-composite in the Volume Profile Pack, the TPO micro-composite (MC) helps you profile longer spans of time than a session. Available in the Pro Edition only. 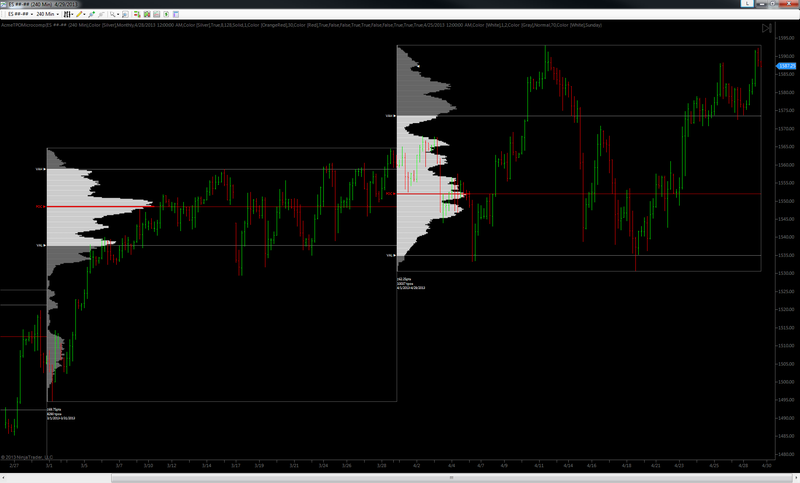 Generates profiles on any built-in NinjaTrader bar type. Profiles can be created from a custom range of dates or created automatically from regularly occurring calendar events including weeks, months and years. The span of time covered by the MC can be outlined in your choice of colors, widths and styles, if desired. 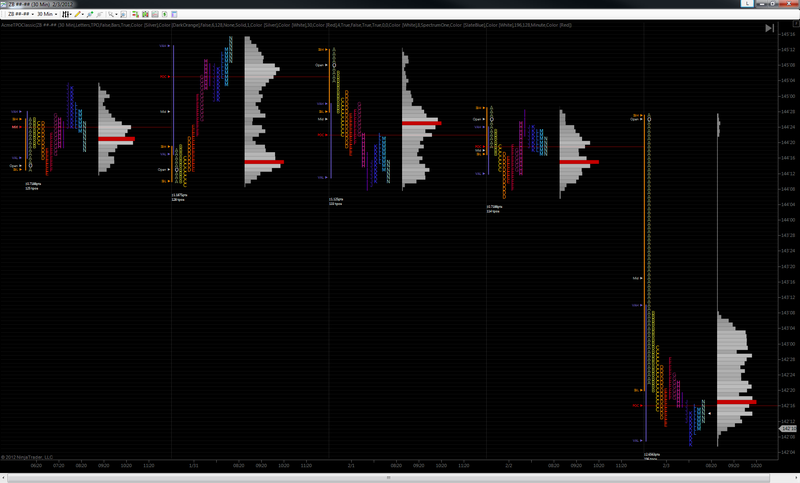 A summary is displayed below the profile and includes the total TPOs, range and span of time included in the MC. The MC’s naked POC can be displayed, and then hidden once touched by price after the end date of the MC. MC width and all colors are configurable for seamless integration into virtually any chart color scheme you can dream up. While the Acme TPO and TPO Classic are mostly about intraday time frames, the TPO Evolution is all about weeks, months and even years. It uses 3 essential dimensions – range, width and color-tuned time – to help you view the big-picture auction action. Available in the Pro Edition only. » An Evolutionary Walkthrough: Quite a bit of information is encoded into this study. So much so that it deserved a post of its own to walk through how to read it. So it got one. Read it here. Designed specifically for reading auctions on the important-to-humans durations of weeks, months and years. 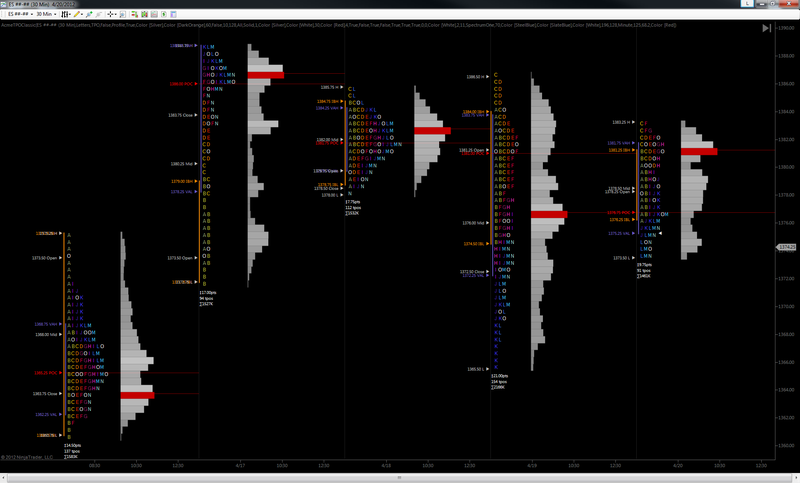 Displays important auction “landmarks” on the profiles, including the period open, high, low, mid, close, POC, pivot point and value area. 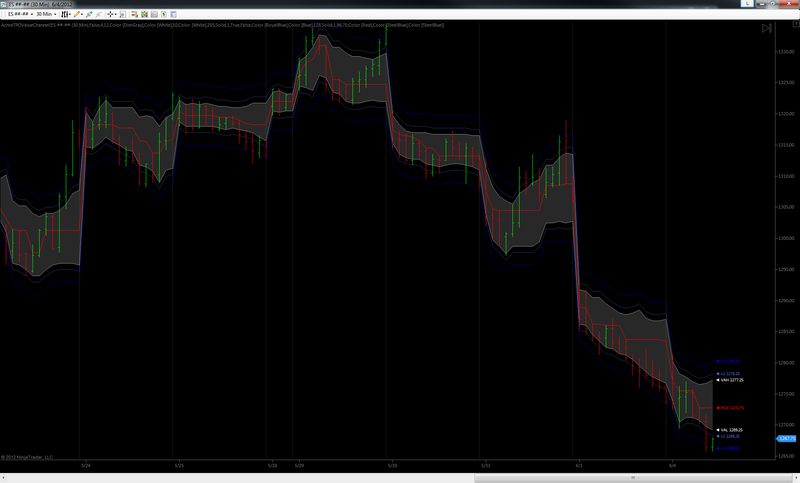 Displays key period profile metrics on the summary such as range, width and area (TPO count) relative to a configurable moving average. See below for details. TPO periods are configurable from 5 to 240 minutes to tailor the display resolution of the profile to your instrument and time frame. 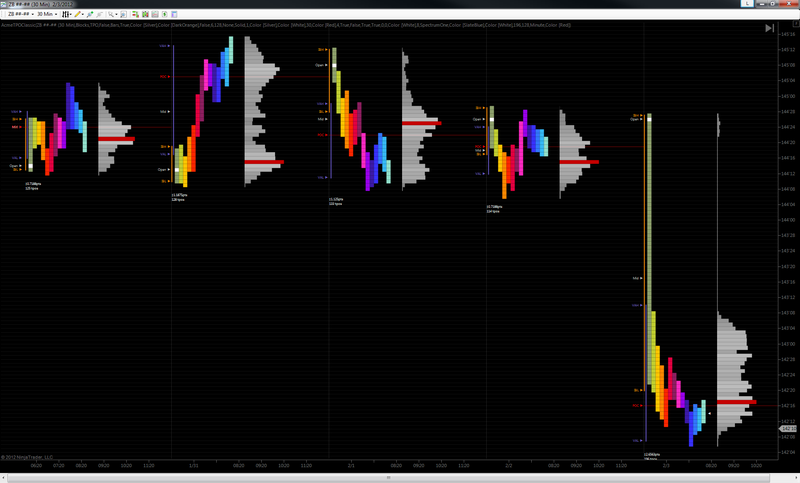 Features a map-style time/color legend that can be placed in any of the four corners of the chart. Weeks, months and years can be combined to form micro-composites. For example, 2 week profiles can be created to create semi-monthly profiles or 4 months can be combined to create quarterly profiles. Note this is a long term study that analyzes and displays a tremendous amount of data. Be aware that loading and scrolling may take a a bit of extra time for very long-term charts, depending on your hardware. Additionally, it can only be used on week, month or year bars. As with the other long-term studies, this one must be used with the Default 24/7 session template in order to capture and display the full range of data.